Billy Huff, 93, of Marshalltown, Iowa passed away on Wednesday, August 8, 2018, at the Iowa River Hospice Home in Marshalltown, Iowa surrounded by his loving family. Funeral services will be at 1:00 p.m. on Saturday, August 11, 2018, at the First Baptist Church in Marshalltown, Iowa. Visitation will be one hour prior to the service at 12:00 noon at the church. Military Honors will be provided by the combined VFW/American Legion guard. Memorials may be directed to Iowa River Hospice. For condolences or questions please visit: www.mitchellfh.com or call 641-844-1234. Mitchell Family Funeral Home is caring for Billy and his family. Billy Glenn Huff was born at home on Marion Street on January 2, 1925; he was the son of Clyde Newton and Myrtle Berdella (Shelmadime) Huff. 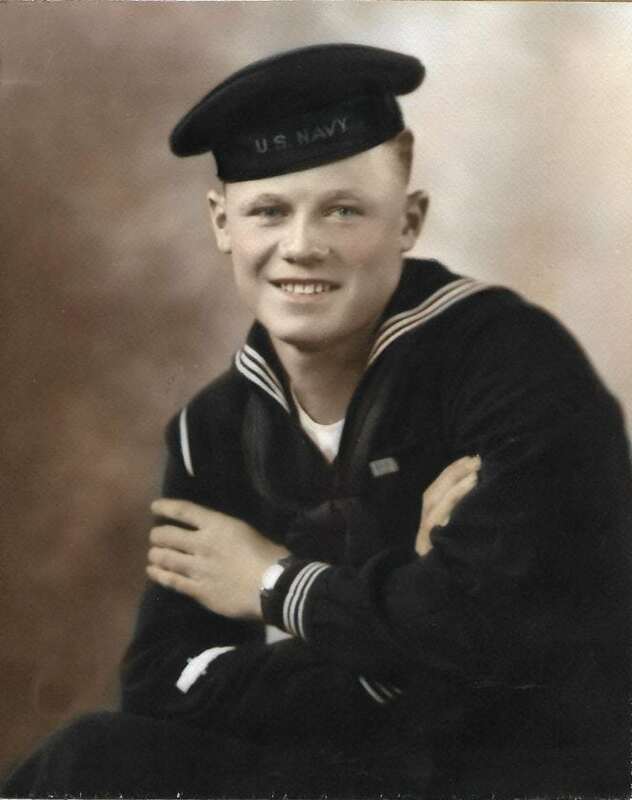 He attended school in Marshalltown and left school to join the military in the United Sates Navy from 1942 until 1946. On June 9, 1945 he was united in marriage to Wilma Harriet Ballad in Omaha, Nebraska. They had lived in Marshalltown until his retirement from Lennox Industries after 40 plus years of service. They moved to Arkansas for 10 years and then back to Marshalltown. After Wilma passed away he was married to Coralynn Vis and they enjoyed their life together. He had been a member of UAW, Marshalltown Gun Club, American Legion and Central Christian Church. He loved to fish and hunt, and was very blessed to go to Canada to fish. The light of Billy’s life was his children, grandchildren and great-grandchildren and loved to go to any event they were in. Left to cherish his memory is his wife Coralynn Huff; children, Randy (Janice) Huff of Tama, Iowa, Glenna (Jim) Wickersham of rural Rhodes, Iowa, Van (Donna) Huff of rural Marshalltown, Iowa and Jana (Jim) Sawtelle of Mankato, Minnesota; step-children, Vicky, Loren, Don and Shannon; grandchildren, Melissa (Rene), Jeffrey, Jeremy (Amy), Angela, Shelly (Eric), Jason (Katie), Matthew (Amanda) Sean, Erin (David), Kyle (Liz) and Kameron; and great grandchildren, Justin, Brittany, Zachary, Andrew, Tanner, Jude and Daniel. In death Billy rejoins his parents, Clyde and Myrtle; great-grandson Ryan; brothers, Russell, Roger and Jim as well as his son-in-law Jim Weaver.